Combine above 2 items into a pot and bring to a slow boil. Cover with lid and cook on medium high for 10 minutes or until cauliflower is tender. 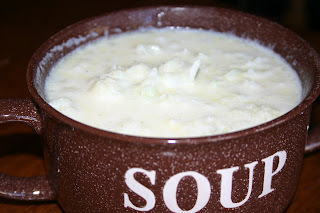 Once cauliflower is tender, mash with a potato masher to desired chunk consistency. Stir roux into chicken broth/cauliflower mixture. Slowly add 4 c. 1/2 and 1/2 milk. I made these lemon squares yesterday for a party and they turned out really good. 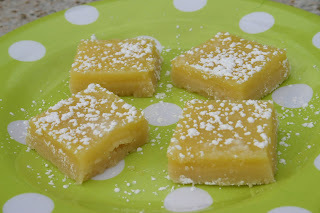 The part of this recipe that caught my eye was that you line the pan with tin foil and after the dessert cools you lift it out of the pan and it makes it so easy to cut into squares. I found this recipe on a website called yourhomebasedmom where she recently put together a lovely lemon recipe collection. I would love to try every single recipe there; I love lemon! Don't preheat oven quite yet. Line a 9 x 13 pan with foil. Spray the foil with cooking spray. Pulse flour, powdered sugar, and cornstarch in food processor. Add butter and process to blend, 9 to 10 seconds, then pulse until coarse. Pour the dry mixture into lined pan and press over pan bottom. Refrigerate for 30 minutes. While it chills, you can make the filling. Preheat oven to 350 degrees. When oven is preheated, bake the pre-chilled crust for 18-20 minutes or until edges are very lightly browned. Filling: Lightly beat the eggs, sugar, and flour together in a bowl. Add lemon juice, lemon zest, cream, and salt and mix well. Reduce oven temperature to 325 degrees. Stir filling again, then pour filling over warm crust. Bake for 20 minutes or until filling no longer appears wet and shaky. Set on a wire rack and cool to room temperature. Lift from pan, place on a cutting board, dust with extra powdered sugar and cut into bars. 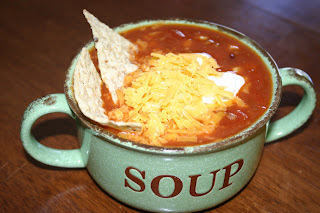 Serve with tortilla chips, grated cheese and sour cream. I've never had a favorite banana bread recipe....until this one. Thank you to My Kitchen Cafe for introducing me to this recipe. Love it! Cream butter and sugar together. Add eggs, bananas, buttermilk and vanilla. In a separate bowl mix dry ingredients. Add dry ingredients to banana mixture. Mix until combined. Divide batter into greased and floured bread pans and bake at 350 degrees for 50-55 minutes or until a toothpick comes out clean. 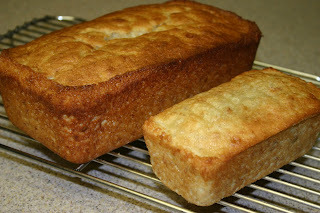 This recipe makes about one large loaf of banana bread (I usually have a bit leftover for a mini loaf pan or I like to use the batter in all my mini's which will fill 5 loaf pans. 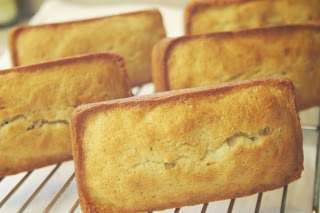 *The timing will be completely different for mini loaves...around 30 minutes, so watch carefully).